Today I am teaming up with 31 other fabulous bloggers to bring you a $550 Kate Spade giveaway. Yep, you heard that right. $550 split between two very lucky winners, to use at any Kate Spade online store. The great thing about Kate Spade, is that it’s not only a great place to shop for your every day fashionista, but also for all you mommies out there. They have diaper bags ladies! I would love to win this giveaway because I am would love to own a Kate Spade bag and it would be my "push present"! I don't have money to buy these fancy brands. I've always wanted to own a Kate Spade bag just like the one in your photos!! I love that one! Praying for a miracle! I do not own a 'name' bag and need to start a collection. This bag would be perfect! Thanks for the chance. I think I should win this giveaway because I don't own a designer handbag- not enough money to buy one. Thanks for offering such a great giveaway! 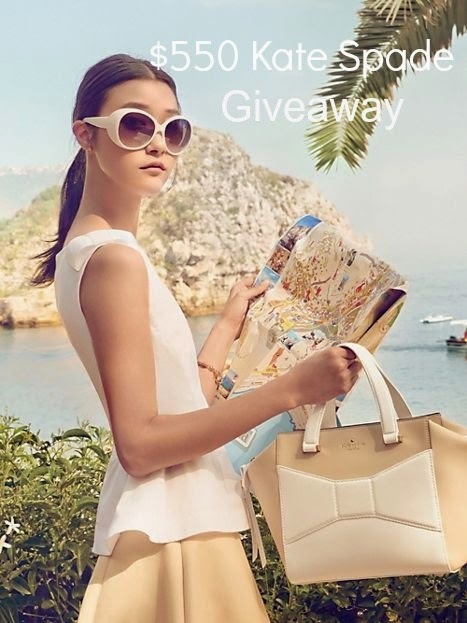 I would love to win because I don't own any Kate Spade items and she has such vibrant spring/summer bags! I think I should win because I never buy anything for myself and would love to own some Kate Spade! Oh my goodness, I could find something really pretty with this giveaway! I think I should win because I cannot get over how adorable everything is from Kate Spade!! I love everything! I think I should win b/c I love Kate Spade! Wow. Not only do I love Kate Spade, but I just got to follow a ton of new blogs and lovely ladies! 🙂 What a great way to find new blogs! 🙂 Thanks for hosting this! What a fabulous giveaway! I think I may just fall over and die if I win. I was in a Kate Spade store in California last month and I wanted to buy a bag so bad, but I didn't get to… so I think that is why I should win lol! Thank you for hosting this giveaway. I think I would be very happy to win this giveaway because I have been wanting a Kate Spade tote or wallet for a long time, and I still cannot justify spending so much money on something branded, though I want it more and more and think very seriously to really get an Elissa tote! Fab giveaway! I would love to own something (anything really) Kate Spade. I don't currently own any Kate Spade but have been swooning over it all for a long time!